Stock markets showed tremendous resilience yesterday, with the benchmark S&P 500 almost erasing the big losses from Monday. This morning, European markets have opened strongly with the FTSE, CAC and DAX all rising by over 1% from the open. Monday was the worst sell off for some time, but it has been swept away as the bulls regain their confidence. If that was the worse the bears can do, world stock markets could have higher to go in the coming months. As a sign of this renewed optimism, oil prices have hit a nine month high at $74.29. Today’s stand out economic announcements are UK retail sales at 08.30 GMT and US unemployment claims at 12.30 GMT. If the US economy shows further signs that the worst is now over, today’s nascent rally could have further to go. 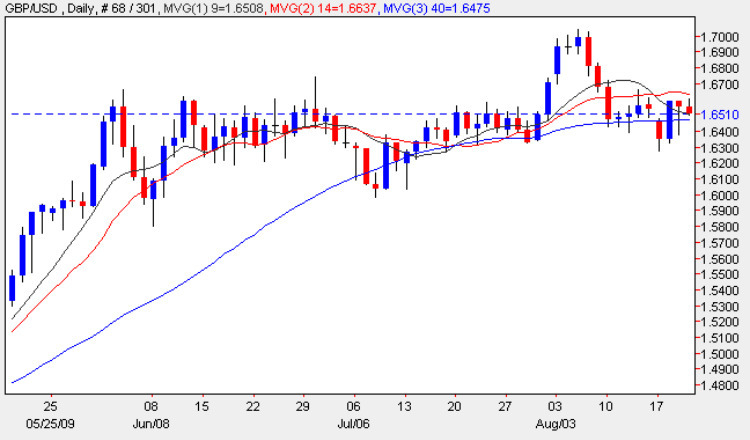 Compared to the big swings seen over the last week or so, it’s been a relatively tepid day so far on forex markets. As usual, it’s been the yen pairs that have seen greater volatility so far this morning. The Asian session saw a renewed appetite for risk with the euro, pound, Aussie dollar and Canadian dollar all gaining against the yen. With only a couple of major news items due today and forex traders seeming to pause for breath, today could be a good day for a barrier range trade on the GBP/USD, especially if there is no reaction to the UK retail sales.